Catalonia, located in northeastern Spain (or “Catalunya” as it is known in Catalan) is home to an array of truly fabulous wine country including the cult wine region of Priorat; up-and-coming Montsant, nearby; the sparkling Cava Winelands of Penedès; the beautiful coastal Empordà on the Costa Brava, and the boutique Alella appellation just north of Barcelona. Other Catalan wine regions include the Conca de Barberà (home to many of Spain’s Cistercian Abbeys like marvelous Poblet), the dynamic Costers del Segre and the tiny region of Pla de Bages. Catalonia offers a range of scenic landscapes from vineyard-covered hills to stunning coastline reminiscent of Northern California, to the mountainous Parque Natural de Montsant where the terraced vineyards of Priorat are located. We have created this week-long private Catalonia Wine Tour to give you a taste of the very best – from the rich and velvety high-end red wines of Priorat, and elegant sparkling Cavas of Penedès, to zippy white wines of Alella and a range of wines made in a Castle in the Costa Brava. We have selected gorgeous hotels for you will stay in a wine spa surrounded by vineyards south of Barcelona, then on to a luxurious Relais and Chateaux in a converted villa in the Empordà. 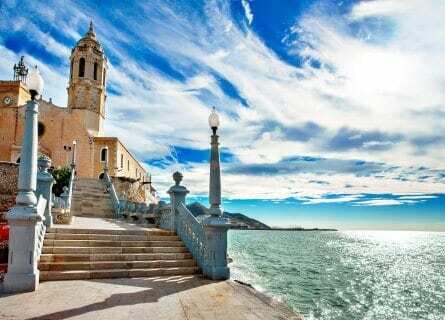 You will also visit the seaside villages of Sitges and Cadaquès, enjoy dramatic coastlines near Aiguablava, dine in some superb restaurants including a 3 Michelin starred eatery on the coast and charming winemakers’ restaurants in small hamlets. 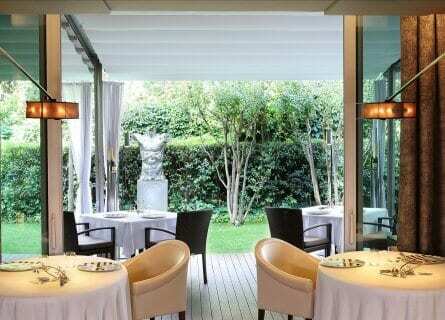 Your tour will conclude with a phenomenal farewell dinner in Barcelona’s superb Cinc Sentits. If you are looking for a private, luxurious and relaxing wine orientated vacation in Spain’s Catalan Mediterranean, ask us for more information on this tour! This morning, your elegant and charming driver and luxurious Mercedes will pick you up in Barcelona, where the tour commences (ask us if you need assistance for hotels and touring in Barcelona before the tour starts). Today you will be heading south into the Winelands of Penedès. You will enjoy a special VIP tour to one of the most highly rated wineries in the appellation such as Parés Baltà, whose Absis wine made in the single vineyard Finca la Torreta, is stunning. Enjoy a private tour of the vineyards including a fun 4X4 tour, followed by an explanation in the cellars including the process of riddling or “Remuage” and finally the best part of the tour- tasting! You will enjoy a very special and personalized tasting of six top wines including wonderful Cavas. Lunch is to follow at the beach town of Sitges. You will have a traditional paella for example, in a charming restaurant overlooking the sea. Take a walk and some free time in Sitges after lunch, and in the late afternoon, you will transfer to your romantic wine resort, in the countryside with views of the Montserrat mountains. Free evening to dine at the estate’s exceptional restaurant. Today, the beautiful terraced wine country of Priorat awaits! This is a major treat. First, you will explore the tiny Scala Dei hamlet with its ruined 11th-century priory, and cute small olive oil and wine shops. 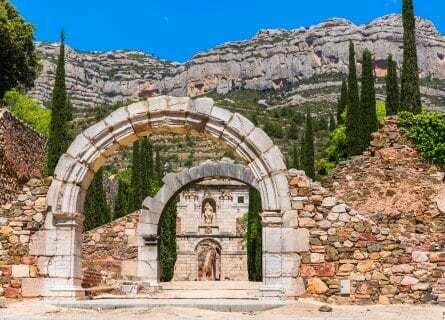 Follow with a VIP visit to a top Priorat (also called “Priorato”) winery such as Costers del Siurana, one of the most prestigious wine estates in Spain and indeed the world. This is no ordinary tour; we will arrange a private and VIP tour for you with the charming owner Carles Pastrana, which will include a jeep tour of the gorgeous vineyards and views of the best Priorat scenery. A tour of the small cellar and a remarkable tasting will follow featuring cru wines such as the flagship Clos de l´Obac and the famed sweetie “Dolç de l´Obac”. Following an unforgettable morning with your hosts at Costers del Siurana, head to Falset where you will have a gourmet tasting menu waiting for you at Toni Bru´s excellent eatery. An innovative and elegant four-course meal will be paired with excellent wines like the white Garnacha based Sant Bru and one of our favorite reds, the Mas de Masos. Taste creative dishes like a Fig and Foie Gras salad and white chocolate soup! Alternatively, you can enjoy lunch right in Gratallops at the Costers del Siurana restaurant, another gourmet reference in the Priorat. After lunch, take a digestive walk and then the drive back to your luxury hotel, free evening on your own to enjoy a walk around the expansive property overlooking vineyards or take in some spa treatments. This morning you will enjoy another winery visit in the Penedès before traveling one-hour north to the coast. You will enjoy a superb tasting menu lunch at 3 Michelin starred Sant Pau run by Carmen Ruscalleda, Spain’s most famous female chef. Her restaurant San Pau is set in a villa overlooking the sea and is a once in a lifetime experience. Dishes are outrageous, creative, imaginative and unforgettable. Sit back, relax and enjoy a long and convivial lunch, all with your keepsake-personalized menu signed by Carmen, who will also come out to meet you. After a fantastic long lunch, head to your luxurious hotel, a one hour drive- where you will be based the next few nights. This graceful Relais & Chateaux is a darling transformed 18th-century villa with pool, spa and a top restaurant, exquisite! Free evening at the hotel to dine on your own- even though you are not likely to be particularly hungry tonight! Up until now, you have tasted some of the best red wines in the Catalan wine country and today’s focus will be more on whites and bubblies, although you will also taste a cru red. Today you will also enjoy some of Catalonia’s prettiest hamlets. 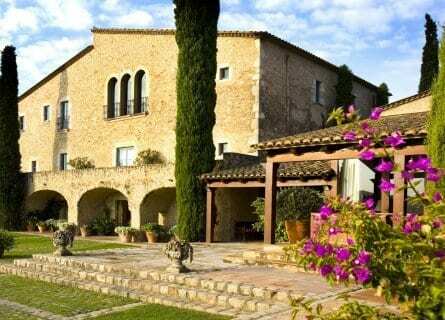 Visit the medieval village of Peralada this morning along with a winery right in the village. You will taste a selection of about six wines; visit the old castle, the deconsecrated monastery, and church and a unique glass museum. One of the largest private libraries in Spain is also on site, quite interesting indeed. 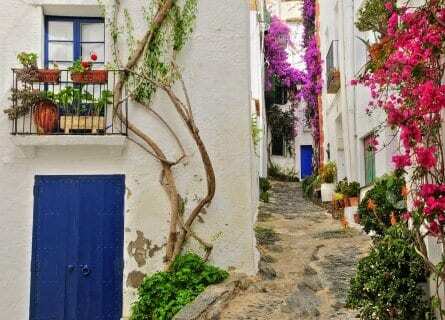 Your private chauffeur will then take you to the picturesque and artsy town of Cadaquès, a very charming seaside village near the French border, where you will enjoy lunch on your own and a free afternoon to take in some shopping and sightseeing. In the evening, return to your luxury hotel for dinner on your own. 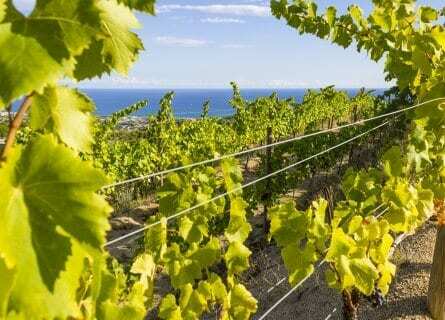 Today the focus is on coastal scenery and the white wines of Alella. First stop is to Aiguablava, about a twenty-minute drive from your hotel. Check out the stunning views! This part of Spain’s coast resembles Carmel and Northern California. You could have a coffee or aperitif before carrying on to explore Sa Tuna and Cap de Begur. If you are visiting in a warm month, bring your bathing suit today! Lunch is on your own at your leisure. We suggest an informal picnic lunch in a pretty cove on the sea, and we can organize the picnic for you of course. In colder months, we can suggest excellent seafood restaurants along the coast. In the afternoon, you are going to head back south to Barcelona, stopping off in Alella at one of the leading estates in the spec of a region such as Parxet. This estate is known for their Cavas, mainly using the Macabeo, Parellada, and Pansa Blanca grapes. The Marques de Alella brand is also owned by Parxet and their white wine is one of the freshest and loveliest white wines in Spain. You will enjoy a short tour and tasting of a few whites and Cavas. In the early evening, arrive at your beautiful hotel in Barcelona, right on the elegant Passeig de Gràcia, located in a converted mansion designed by Modernista architect Domènech i Montaner in 1908. Enjoy a free evening in Barcelona. Today you will explore Barcelona’s gourmet gems with our most enthusiastic and knowledgeable guide. 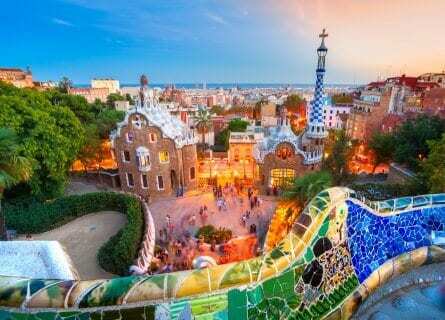 The focus is on food and wine and you will visit the photogenic Boqueria market, wine shops, the cutest cheese shop in Barcelona (with a cheese tasting) and some architectural highlights such as the breathtaking Santa Maria del Mar cathedral. Lunch is on your own with our suggestions. The afternoon is yours to shop, sightsee, rest. Tonight, your private chauffeured Mercedes will come to collect you at the hotel and sweep you away for one last ultra-gourmet dinner at our favorite restaurant in Barcelona. Cinc Sentits (“Five Senses”). Run by the Artal family (Jordi is the outstanding chef and sister Amalia is the very competent and professional maitre), this will probably go down as one of your all-time favorite restaurants. The atmosphere is relaxed, the venue is small, the food is simply amazing and the attention and service are top class. Enjoy this last evening in Barcelona, and the rest of the evening is yours. Enjoy a full breakfast and at your preferred time, your private chauffeur will collect you to take you to your next port of call- airport, train station. This concludes an unforgettable week in Spain’s Catalan Winelands; we hope to see you again! The Pares Balta winery in Penedes was wonderful, very friendly and really made us feel welcome. We had a very nice time. Wow, Arola was lots of fun, really interesting food – what an experience. Cal Xim was our favorite restaurant of them all. Food really fresh, honest, lovely. The owner was so happy – I got a tour of the kitchen and he gave us some wine and sent us home with some cherries and apricots from his garden. Lovely people. Most definitely would recommend Cellar Tours. Well organized and great choice of events. Our driver took very good care of us as well. We had a truly wonderful time. Thanks again.